Arsene Wenger has revealed how he reacted after losing his first game as Arsenal manager so many years ago. According to the Frenchman, he threw up when he first tasted defeat as the boss at the North-London club. 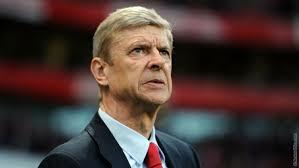 As he is still trying to put behind the 5-1 bashing his side received from the hands of Bayern Munich last week, Wenger has taken time to reflect on some memories at the club. “I’m a competitor. If I speak with my neighbour at six or seven, I was already competing for everything. I was born like that,” Wenger said ahead of his side's FA Cup victory over Sutton..
“When I lose games, of course it’s difficult to take. “Every defeat is harder. I can never transmit to you my feelings about defeats. Wenger went on to rubbish rumours that he is due for retirement at the end of the season as he made it clear that he is ready to fight on. “I’m a positive person. I am a fighter, somewhere – you don’t stay so long in this job otherwise,” Wenger said. “I’ve always seen the future in a positive way. I do not expect too much from outside, I expect more from me inside. “The expectation level gets higher. The fight doesn’t get higher. The fight is always tough.